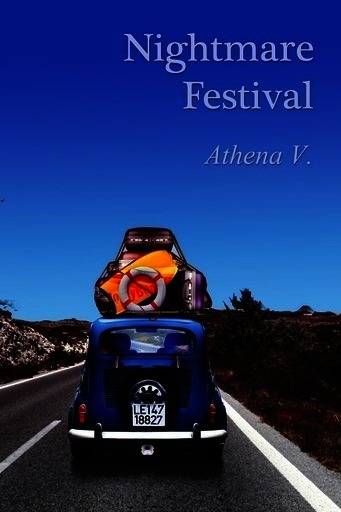 Tablo | Read 'Nightmare Festival' by Athena V.
We've all read that awesome road trip book that makes you want to forget about your worries, hop in the car and hit the road with no destination in mind. This isn't that type of book. A true story about a road trip gone hilariously wrong. Though this isn't my story, all of what I tell you is true. In 2014, my mother was offered to go to Boots and Hearts, a country music festival, with a friend and her daughter. What she thought would be a wonderful week, ended up being an event we would talk about for years to come. When I first heard this story, I couldn't believe what I was hearing. Her weekend with the girls sounded like it was taken right out of a bad comedy movie. One where even Todd Philips would say: "Ok,we've gone a bit too far". So, of course, I must share it with you. Unfortunately, I wasn't present on the trip to document these unfortunate events. However, I assure you that what I've written is as close to reality as could possibly be. I hope you enjoy reading about this unbelievable story as much as I loved hearing about it. It's a gorgeous day today. As I step out of the house, my eyes sting while they adjust to the light. I can feel the sun's rays on my skin which is refreshing since lately all we've had is rain, rain and more rain. Today is going to be a good day. I sit on the chair located beside the front door and enjoy the warmth of the morning sun while the dog roams around the yard. As I close my eyes, making a mental note of the never-ending list of tasks needed to be done that day, I hear a faint sound coming from the house. PHONE! Everyone has a friend like Estelle. Someone who seems to enjoy your company more than you do hers. One that you enjoy but only in small dosage. "Pauline! Everything's gone wrong! This is horrible!" I sigh. "Hi Estelle. What's wrong now." -"I need to tell you in person, you won't believe what's happening to me!" I groaned because one of the reasons Estelle was THAT friend was that she always exaggerated the tiniest things, and I had a hunch this was one of these times. However, curiosity got the best of me, and I agreed to meet her at the local Tim Horton's - the most entertaining place in this small town. After having ordered our coffee, we sat down so she could tell me what she was so upset about. Turns out she had bought three tickets for Boots and Hearts. She had planned to spend a week at the Country festival with her two children. However, that morning her barely adult son called her to cancel. - "It was supposed to be a family bonding time. Now it's all ruined." I thought about it for a second and responded. "So make it a girl's weekend. You won't have Greg around but a girls weekend is just as fun. I went to Las Vegas with my daughter a few years ago, just the girls, and we had a great time!" Estelle's face lit up. She agreed that a week between girls was a great idea and something she'd needed for a long time. But she still had an extra ticket. I was torn. Even though I was flattered, I wasn't sure I could survive a week in her company. I hadn't spent more than a few hours with her at a time and most of the time, a few hours was more than enough. All that considered, I agreed. I'm aware it might have been stupid of me to agree to spend a week with a friend that drove me a little bit closer to insanity after spending an evening with her. I'll explain my thought process. I live in a small town in Northern Ontario. Somewhere between North Bay and Sudbury. I've seldom travelled out of the area. Except for the trip to Las Vegas with my daughter, I've lived a pretty sedentary life. A girls' weekend out of town sounded appealing and I told myself, I'd have time to really get to know Estelle and maybe, in turn, appreciate her a bit more. After running my decision through my head a few times, I became more confident that it was a good one. By the time I got home, I was excited about the idea. As soon as I walked in the door, I told my husband the news to which he responded "A week? With Estelle? Really? uh. ok."
Obviously, he wasn't convinced it was a great idea but just shrugged and went back to his reading. Later that night, while I was on the computer, I noticed the little green dot beside my daughter's name on the Facebook chat. It took a while but finally I saw "Athena is typing" at the bottom of the screen. - I've been offered to go to Boots and Hearts! - Seriously... Estelle? AND her daughter? You can hardly handle one of them for a few hours. Plus you do know that they bicker ALL the time. I shook my head. Even my own daughter doesn't understand how good this is. I started typing and explained how I saw the situation. After a few minutes she answered : "All right then, let me know how it goes". I put the last of my bags beside the door. A combination of worn out shorts and t-shirt along with camping gear I've managed to find here and there. Flashlights, a portable grill borrowed from my brother, and an enormous cooler I've found in the back of the garage from my own camping days; check check and check. As I was looking at my pile, satisfied by my contribution, the phone rang. I hurried upstairs and in a swift motion, grabbed the receiver. It was Estelle, letting me know she'll be at my door tomorrow at eight am as opposed five am as previously discussed. Her daughter refused to wake up before sunrise. I didn't make a fuss. If we'd leave at 8 am, we'd still get to Bowmanville at a decent time and be able to enjoy what was left of our day . Plus, I got to stay a few extra hours in the comfort of my bed. Awesome! I woke up to the sound of the radio. 7 am. I moved the blankets to my side and felt around my night stand for my glasses. After a few stretches and yawns, I stumbled downstairs to start a cup of coffee. I love the smell of coffee. Its warm and familiar aroma surrounds me as it brews. I pour myself a cup and sit at the table, warming my hands around the cup while reading the paper as the sun peaks in through the window. It's one of those perfect, quiet morning. I look at my watch, 7:45, the girls will be here soon. I quickly change and pull my hair into a quick pony tail. I glance at myself in the mirror. Thank god I'm only going camping. 8:30. Still no sign of them. I give Estelle a call and she informed me that was was still home and was leaving very soon. Since it's an hour drive from her house to mine, I wasn't expecting her for a while still. The reason for her tardiness, she said, was that her son of 21 years of age needed to get to work. However, he refused to take the bus or to ask his co-worker and friend, who passes by every day to give him a lift so Estelle offered to be his method of transportation. At 9:45 I hear tires rolling in the driveway. I look through the big picture window in the living room and see their SUV parked in the driveway. Quickly, I grab my baggage and run outside. Estelle climbs out of the car sporting a sequin top, knee length skirt, and high heel sandals. I stopped, comparing her attire to mine, worn shorts and a simple green t-shirt. She waves excitedly and runs around the vehicle to open the trunk. I was in awe. The SUV was packed to the rim. Suitcases over suitcases filled with clothes, shoes and makeup. I looked in my arms. No way would my bags fit. I chose to keep my small duffel bag of clothes for the week, squeezing it in the largest space I could find . "All right" I say as I climb in the back seat. "Bowmanville, here we come!"